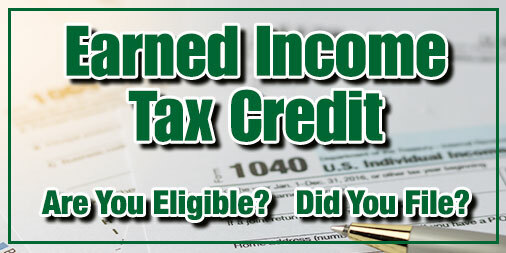 Many taxpayers are not aware that they may qualify for the Earned Income Tax Credit. Below you will find information on how to find out if you are eligible, how to apply, and more. What is an Earned Income Tax Credit (EITC)? The Earned Income Tax Credit, EITC, is a benefit for working people with low to moderate income. To qualify, you must meet certain requirements and file a tax return, even if you do not owe any tax or are not required to file. EITC reduces the amount of tax you owe and may give you a refund. Married couples and individuals may be eligible for $510 to $6,318 in federal tax credits. If you are seeking an EITC for the first time, you can get refunds for the 2014, 2015 and 2016 tax years. Do I Qualify for EITC? To qualify for EITC you must have earned income from working for someone or from running or owning a business or farm and meet basic rules. And, you must either meet additional rules for workers without a qualifying child or have a child that meets all the qualifying child rules for you. See the EITC Income Limits, Maximum Credit Amounts and Tax Law Updates for the current year, previous years and the upcoming tax year. When Can I Expect My Refund? If you claim the earned income tax credit (EITC) or the additional child tax credit (ACTC) on your tax return, by law, the IRS can’t issue your refund before mid-February. Find out more on when to expect your refund. After you file your return, the best way to track your refund is Where’s My Refund? or the IRS2Go mobile app. Use the EITC Assistant to see if you qualify for tax years: 2017, 2016 and 2015. The EITC Assistant helps you find out your filing status, if your child is a qualifying child, if you are eligible and estimates the amount of the EITC you may get. Twitter and Facebook I post regular updates on legislative action, committee developments, useful state-related information, happenings in the 24th Senatorial District and more on Twitter @SenatorMensch and on my Facebook page. If you find this e-newsletter useful, I invite you to visit my website www.senatormensch.com for more information about your state government. If you do not wish to receive this email, click here to unsubscribe.